TII's Lightning Surge Protector greatly increases subscriber premise reliability and reduces consumer electronic equipment failures. These failures are caused by induced HIGH VOLTAGE surges that appear on the center conductor of coaxial drop cables within the home. 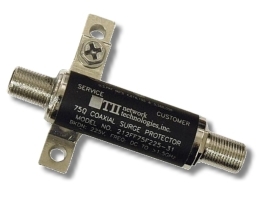 The protector's unique IN-LINE design and 75 ohm impedence matching is virtually transparent to all analog or digital bi-directional signals utilized in the bandpass of DC to 1.5Ghz.